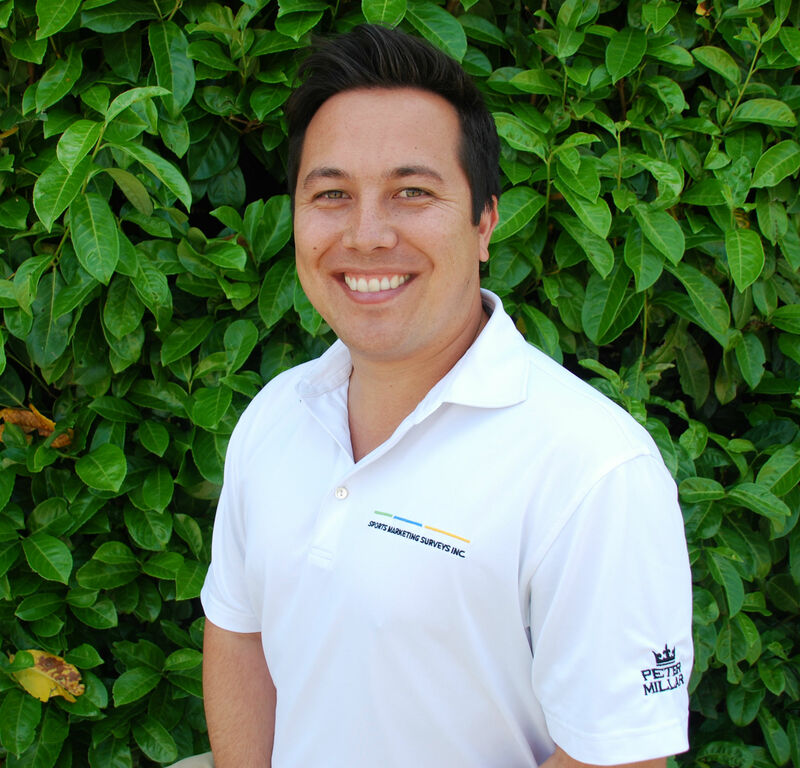 THE OUTSIDE VIEW: GOLF IS NOT BROKEN | Sports Marketing Surveys Inc. 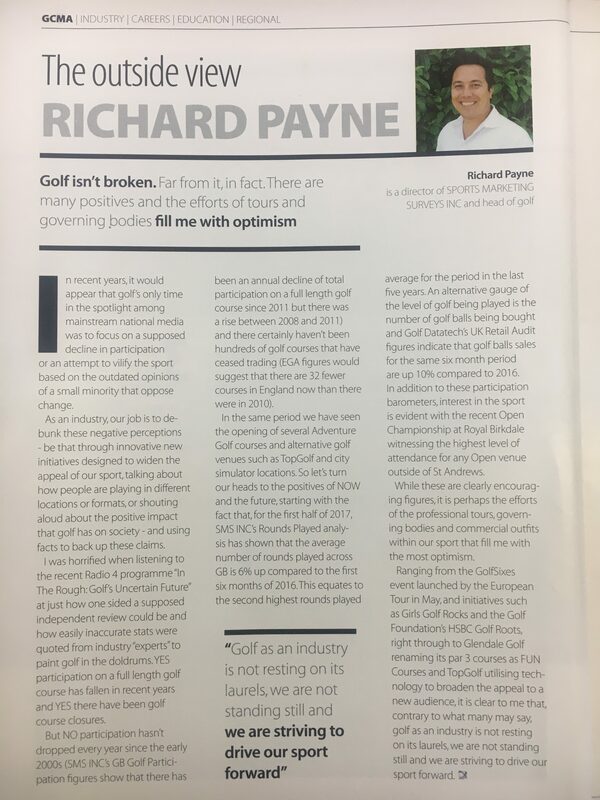 This month, SMS INC.’s Richard Payne featured in The Golf Club Manager (Official magazine of the GCMA), discussing the state of golf in the UK and how it’s in better shape than the media suggest. The article is on the GCMA website, and is also attached below. In recent years it would appear that golf’s only time in the spotlight amongst mainstream national media is to focus on a supposed decline in participation or an attempt to vilify the sport based on the outdated opinions of a small minority that oppose change. As an industry, our job is to debunk these negative perceptions be that through innovative new initiatives designed to widen the appeal of our sport, talking about how people are playing in different locations or formats, or shouting aloud about the positive impact that golf has on the society – and using facts to back up these claims. As a result I’m sure, like many of you, I was horrified when listening to the recent Radio 4 programme “In The Rough: Golf’s Uncertain Future” at just how one sided a supposed independent review could be and how easily inaccurate stats were quoted from industry “experts” to paint golf in the doldrums. YES participation on a full length golf course has fallen in recent years and YES there have been golf course closures but NO participation hasn’t dropped every year since the early 2000s (SMS INC.’s GB Golf Participation figures show that there has been an annual decline of total participation on a full length golf course since 2011 but there was a rise between 2008 and 2011) and there certainly haven’t been hundreds of golf courses that have ceased trading (EGA figures would suggest that there are 32 fewer courses in England now than there were in 2010) and in the same period we have seen the opening of several Adventure Golf courses and alternative golf venues such as TopGolf and city simulator locations. So let’s turn our heads to the positives of NOW and the future, starting with the fact that for the first half of 2017, SMS INC.’s Rounds Played analysis has shown that the average number of rounds played across GB is 6% up compared to the first six months of 2016. This equates to the second highest rounds played average for the period in the last 5 years. An alternative gauge of the level of golf being played is the number of golf balls being bought and Golf Datatech’s UK Retail Audit figures indicate that golf balls sales for the same 6 month period are up 10% compared to 2016. In addition to these participation barometers, interest in the sport is evident with the recent Open Championship at Royal Birkdale witnessing the highest level of attendance for any Open venue outside of St Andrews. Whilst these are clearly encouraging figures, it is perhaps the efforts of the professional tours, governing bodies and commercial outfits within our sport that fill me with the most optimism. Ranging from the GolfSixes event launched by the European Tour in May, and initiatives such as Girls Golf Rocks and the Golf Foundation’s HSBC Golf Roots, right through to Glendale Golf renaming its par 3 courses as FUN Courses and TopGolf utilising technology to broaden the appeal to a new audience, it is clear to me that, contrary to what many may say, golf as an industry is not resting on its laurels, we are not standing still and we are striving to drive our sport forward. This is the message that we need to spread far and wide – Golf is NOT broken and it is a fun, family-friendly, flexible sport for all.